When I hear the word “sensuous,” I usually think of things like steamy novels, bubble baths and fleece blankets. But a documentary I narrated for the American Steam Railroad Preservation Association (ASR) did it’s very best to add another item to the sensuous list: the steam locomotive. Trouble viewing embedded video? Click here. Young’s quote comes from his 1963 book “Iron Horse Rambles and the Reading T-1’s,” a story of the Reading Company’s T-1 engine that emerged from retirement to take passengers on excursions around the engines’ home state of Pennsylvania. Known as “rambles,” the excursions were designed to take modern folks back to a time when steam locomotives ruled the rails. But alas, the iron horse rambles eventually ended and the only four surviving T-1 engines were taken out of operation. 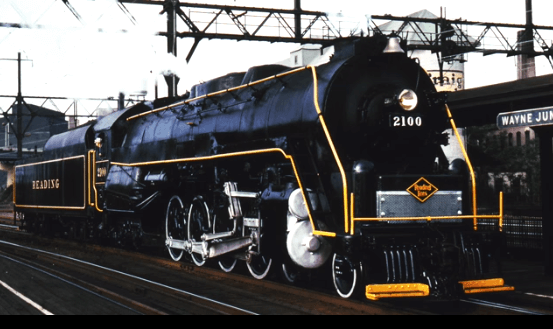 Built in 1945, Reading’s Steam Locomotive 2100 is one of those survivors – and its story is the topic of the video. The video narration kicks off with a sad and lonely narrative tone and music to match the sad and lonely fate of the once formidable 2100. The engine sits idle, with its bleak interior, grungy exterior and the wind howling through the open chambers that once used to be its windows. My narration voiceover then helps take viewers on the long, winding journey the 2100 endured over the past decade or so, eventually ending up transported to Tacoma, Washington. There it again sat idle for several years until a restoration project team in Illinois was looking into a different engine to refurbish to its former glory. The ASR stepped in with a pitch for the good ole 2100. The Illinois people bit, and the engine was soon on its way to Ohio for a total revamp to get it ready for its new destination. But the story doesn’t quite end there. The ASR is in charge of restoring the 2100, a task estimated to take $700,000 – which is the overall point of the video. Telling the story of the engine, touching on the history and impact of steam locomotives in America, and highlighting people’s fascination with these sensuous machines all work together to stir up emotions and nostalgia. I was asked to match my narrative tone and style with the compelling story, mood music and striking visuals that included footage from Hugh Fuller and axle17921, all of which was brilliantly produced by Lynchpin Creative. One of the perks of my work as a female voice-over talent is learning new things on a regular basis. In this case, I learned about the background and arduous restoration process of an important piece of American history. Beautiful video, the images and the score. And your subtle shifts in tone as well the overall was just great. That’s why you’re a pro! People think ‘Ah, I could narrate that!’ don’t understand. I could almost see the slight smile when you sid sensual at the end there! Very nice work Debbie. Why thank you so much for reading and listening Andy! That means a lot to me. In this day and age, when there are so many new people flooding into the VO market, it’s nice to have a pat on the back for a job well done. You’re very welcome! It was great work all around!